The Cake Inventor has done it again! A wonderful marriage of moist coconut cake with a sweet passionfruit drizzle. Topped with elegant flaked coconut. 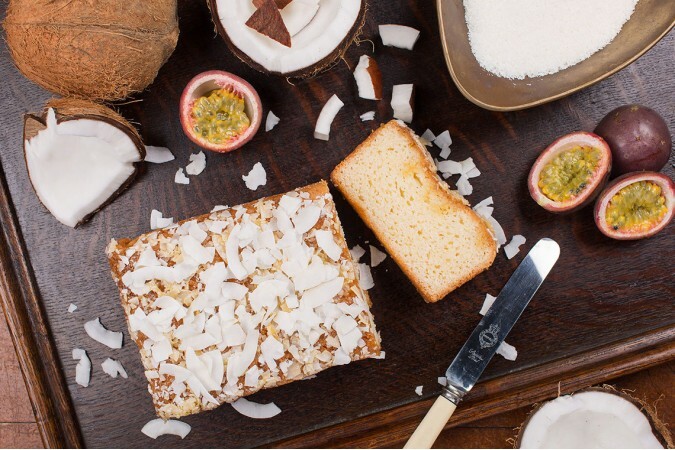 We even include a pouch of flaked coconut for you to finish this loafcake off yourself, for the perfect home baked look. White Sugar, Flour Blend (Rice, Potato, Tapioca, Maize, Buckwheat), Coconut Oil, Free Range EGG, Buttermilk (MILK), Coconut 9%, Passion Fruit Puree, Raw Desiccated Coconut 5%, Raising Agent: (Mono Calcium Phosphate, Corn Starch, Sodium Bicarbonate), Salt, Xanthan Gum, Coconut Natural Aroma (Coconut Natural Extract, Inverted Sugar, Glycerine [E422]).